Gobboween has arrived on Archos! It’s a festive (and frightening) time of year when creatures all over the planet begin to act strangely as a result of Gaia’s influence - some even transform into terrifying new forms! Get ready to discover new creatures and unlock new Schemas for Gobboween-exclusive armor, weapons, and more! Gobboween has begun! For the entire month of October, you’ll be able to find enchanted jack-o-lanterns spread throughout Talos, Estel, and Ironfast. I wonder what you might find if you were to crack a few open…? 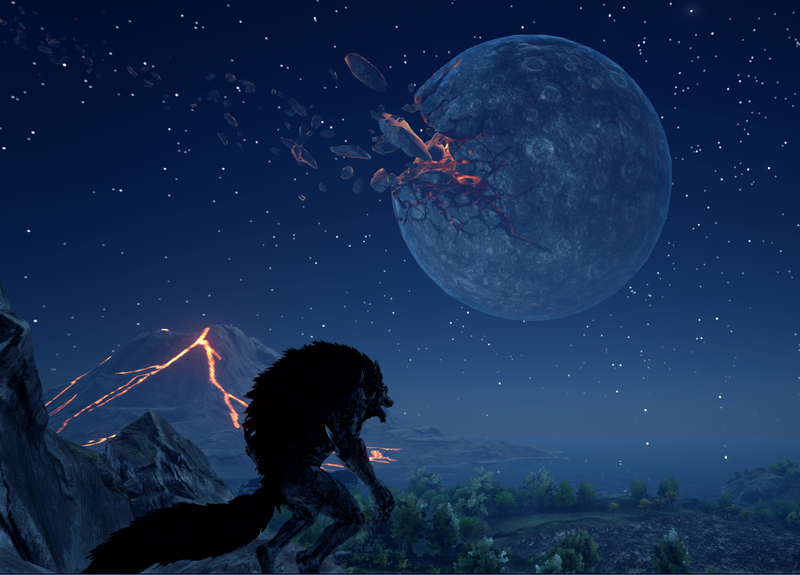 Alpha Wolves: Some extremely aggressive wolves have been spotted roaming in packs around Archos. They’re dangerous enough during the day, but you definitely don’t want to be around them when night falls. Elite Dark Reapers: These powerful enemies show up rarely after high-level meteorite crashes. Their teleportation magic and ranged attacks make them particularly dangerous foes. It’s recommended to gather a group of well-equipped Adventurers before attempting to take one down. 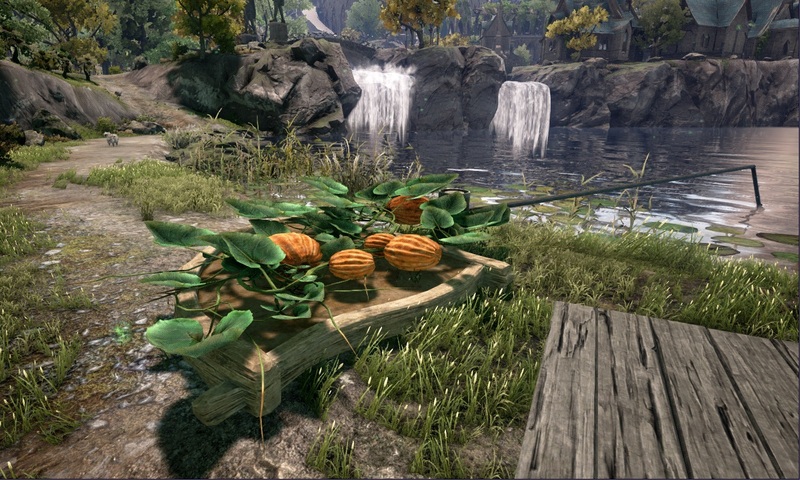 Pumpkins and Pumpkin Seeds: Pumpkins are a popular treat during Gobboween - gather some seeds to plant a patch of your own! Once they’re fully-grown, you can use them to make some delicious treats or Gobboween-exclusive Schemas. Goblin Candy: Goblins have been producing a variety of strange, enchanted candy - if you manage to get some for yourself, eat them at your own risk! New Schema - Jack-O-Lantern Helmet: This strange headpiece can only be collected from the Elite Goblins that roam Archos during Gobboween. Despite its appearance, it’s actually a fairly sturdy piece of armor. Wearing it might also help reveal some hidden information about some of Gobboween’s new items! New Schema - Fusil: This light ranged weapon can now be crafted at a Workbench and used to fire specially-designed bullets for taking down enemies at a distance. New Schemas - Gobboween Decorations: Get in the Gobboween spirit by decorating your home with some spooky glowing jack-o-lanterns and more! New Schemas - Transformation Runes: A variety of new Transformation Runes have been added to the Shape-Shifting Knowledge Node. There’s also a Gobboween-exclusive new Transformation Rune that can only be found by taking down a specific new creature. New Weapon - Sunder Scythe: This powerful scythe can only be found after defeating an Elite Dark Reaper. Its magical enchantments give it the ability to destroy an opponent’s armor in just a few strikes. 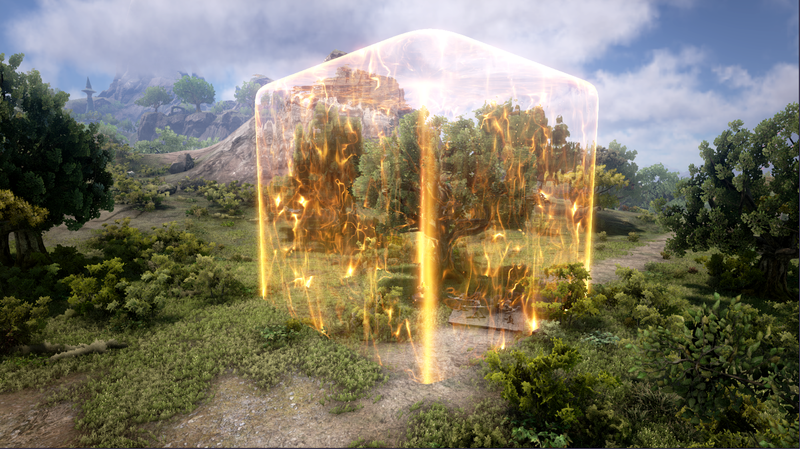 New Structure - Magicka Base: When powered with Magic Essence, this structure provides a smaller shield than a House Seal, but with the added benefit of preventing any non-allied creature or player from passing through it. A single House can support up to 3 Magicka Bases at once. New Structure - Guardian Tree: This tiny sapling might not look like much, but if you plant it near a House Seal and take care of it, it might repay the favor some day. Wooden Structures: Textures have been slightly improved. Fertilizer: Fertilized plants now display a timer showing when your crops will run out of fertilizer. Steam Achievements: Now properly configured - get out there and start earning some achievements! Icon Makeover: A number of items have had their icons updated. Dark Reapers: Added a ranged attack. Small Spell Tower - Corrosive Ray: Increased base damage from 60>75, increased attack speed interval to 0.4 seconds, and increased armor reduction debuff value from 2 to 3. Fixed a bug where tamed creatures would be stuck crafting an item at 99% permanently after a server restart. Fixed a bug where some structures would never load in after loading into the game. Fixed a bug where it was impossible to earn Dwarven Manor Knowledge experience. Optimized rainfall effects to reduce the amount of lag caused across the server. Fixed a bug where it was possible to place a Goblin Ballista underwater. Fixed a bug where Elemental / Imp attacks would occasionally cause player attacks to be canceled. Creatures can no longer be polymorphed while reviving in the Summoning Pool. Removed vegetation that was rarely being utilized to help improve game performance and load times. Fixed a bug where players would get launched to extreme heights when polymorphing a Gryphon while standing on top of it. Fixed a bug where a large number of trees around the world were randomly removed, or had no collision. Fixed a bug where creatures revived with a Soul Stone would be level 1 with minimum stats. Fixed a bug with aggressive creature spawns - they should be less common around cities now. We’ll be keeping an eye on feedback with spawn frequencies and continuing to make adjustments as necessary. Optimized a number of models used for terrain - this may have an unintended detrimental effect on some player structures depending on their location, but any damage should be very minor. Fixed an exploit related to the Forging system. Implemented a number of minor localization fixes. Some creatures may have somewhat larger aggro ranges than normal. Panther spawns around certain areas may still be a little aggressive - we’re keeping an eye on this issue. Goblin Candy - Goblin Transformation currently has a bug where your character will die instantly if Hunger drops below 50%. We plan to have this resolved in a hotfix shortly after the update.